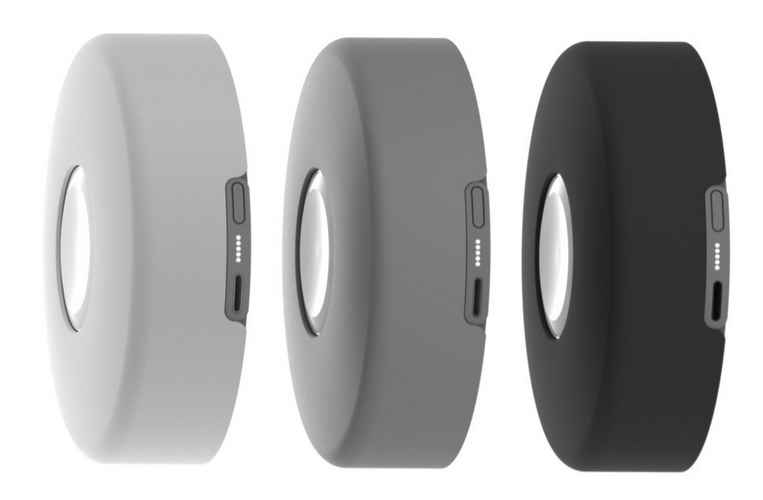 Accessory manufacturer Nomad today revealed the Pod, a mobile battery and cable management device that promises to provide the upcoming Apple Watch with up to four full charges, no doubt aimed at users unsure of the Watch's confirmed 18-hour lifespan (via TechCrunch). The Pod houses a small but powerful 1,800 mAh battery as the source of the four full charges claim, but added USB and USB-C ports mean virtually any device powered by either USB connectors can find charge from the unit. Still, the Pod's specifically designed functionality, housing a base aimed at organizing the Watch's MagSafe charge cable, means Nomad is definitely targeting early adopters of Apple's upcoming wearable. The company is also known for the NomadClip, which houses a USB and smartphone charger in its small carabiner frame, and even announced an Apple Watch stand of its own. Although pre-orders are open, as TechCrunch points out, Nomad is still awaiting a few specifications from Apple before going into production. Nomad says it’s been in communication with Apple, and is simply awaiting the final physical dimensions of the Apple Watch charger to it can get the Pod to production. Of course, you could always just use existing power banks with the cable to achieve the same results, but Nomad’s design gets points for space-saving creativity. Many well-known accessory manufacturers have announced products for the Apple Watch recently, including Griffin, Pad and Quill, and Twelve South. Those announcements mainly focused on docks and stands for the wrist-worn device, with not much revealed in the vein of a mobile battery solution for the wearable akin to the Nomad Pod save for the Reserve Strap, which aims to keep the Apple Watch charged while still on the wrist. The Nomad Pod will come in Silver, Space Grey, and Matte Black Plastic, costing those interested $59.99 upon pre-ordering on the company's official website. Nomad says the devices will begin shipping on June 15 and notes that only 5,000 units are planned to be made for the first run of the mobile charging pod. The below photo really puts into perspective the upcoming challenge for the Apple Watch. Considering that the original iPhone ran for a day, and the iPhone 6 runs for maybe slightly longer than a day, and the iPhone 6 Plus sometimes runs for about two days with a much larger device, I have my doubts that we will see anywhere near week long battery in the Apple Watch in this decade. Especially since Apple loves to slim down everything. Ironically this makes me want to just buy the current model, so I was hoping the second or third gen would have much better battery life. Probably not! I was intrigued until I saw the price. I'll wait for Anker to make something similar. Hmm... Nomad Pod. I can't think of anything ironic about the name of this product. On a serious note, that certainly says something that the Apple Watch already has an ecosystem of accessories and the thing hasn't even been launched yet. And boy, these guys are sure on the ball with a USB-C connector when there are all of three products on Earth (that I'm aware of - Nokia N1, Chromebook Pixel 2015, and MacBook 2015) that use it so far. I think USB-C will be super common by next year. Doesn't look like this will work well for the link bracelet or milanese loop. I guess you'd have to disconnet the bracelet from the face, which seems like a pain. A $60 accessory is too much for a $400+ device? If so, you should save your money and not buy the watch. I don't think week-long battery life under regular use is even on the radar for Apple products. Its taken Apple 7 years to make the iPhone last a full day under heavy use. If the Apple Watch can last 18 hours under a mixed-use scenario, I think we'll see the same in the second gen with a thinner profile or perhaps even 24 hours and thinner. Charging our smartphones and laptops daily or every other day is a reality that we live with, and its honestly not much of a hassle. I think we'll see advancements in faster charging sooner than much longer battery life. If anyone has some knowledge of near-future battery tech advancements, it would be cool to hear their perspective. You're very right about faster charging batteries being the next big advancement. I also hope some density comes with it. I've read about many amazing battery tech advancements over the years, but they never really come to fruition in product form. There was this one that I read about back in the mid-2000s about how we'd be running our laptops for weeks on a 15-20 minute charge. Never happened. However, I am quite excited about some of the things I've read about graphene. But at the moment graphene seems like the super material that is going to save everythingsuch as replacing silicon in computers. Would be neat if it did, but we'll see how it pans out. What I'm hoping is that Apple's research into electric cars will allow them to make breakthroughs in new battery tech. The layered battery in the new MacBook, for instance, is quite interesting.